ODENTON – Gratitude is evident, as is generosity. For several hundred Haitian children, the lunch provided by the parish school in St. Peter of Poteau will be their only substantial meal of the day, so visitors notice when a 7-year-old leaves some rice and beans in his bowl to take home. “The children are thinking not only of themselves, but their entire family,” said Kathy Grey, one of the leaders of St. Joseph in Odenton’s participation in the Baltimore Haiti Project. Since 2005, the 980 families of St. Joseph and its soon-to-retire pastor, Father William L. Viola, have made room in their substantial annual giving for St. Peter Parish and its missions, which are located a few miles east of the city that gives the Diocese of Gonaives its name. 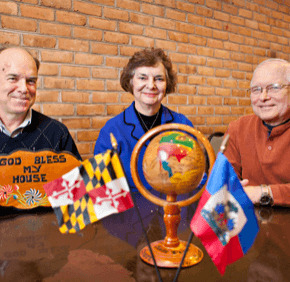 The Anne Arundel County parish is one of 21 in the Archdiocese of Baltimore that currently partner with parishes in the Diocese of Gonaives. Jan. 12 will mark the four-year anniversary of a devastating magnitude 7.0 earthquake that rocked Port-au-Prince, the capital of the most impoverished nation in the Western Hemisphere, and sent hundreds of thousands north to the province of Artibonite, which numbers 1 million. Flooding and a cholera epidemic swept through the province in 2011, making all the more vital the help flowing from Baltimore to Gonaives in general, and specifically from Odenton to Poteau. St. Joseph made possible the construction of a school building with four classrooms, essentially doubling capacity at the St. Peter School. It also sent funds for the drilling of a well, replacing a shallow one at the campus that includes an attractive church. That aid is in on top of the $28,000 St. Joseph spends annually in Poteau, to pay teachers’ salaries and provide that daily meal to 350 students. Outreach that began nine years ago with Deacon David L. Page on a one-man fact-finding mission will send as many as seven parishioners to Poteau in March, to observe and monitor progress at St. Peter Parish. Grey and her husband, Gary, are among the parishioners who have taken their expertise to Poteau. They met in 1981, in a Swahili class in Tanzania, where Kathy was a Maryknoll lay missioner teaching English and domestic science to postulants of the Immaculate Heart Sisters of Africa, and Gary taught math and science to junior seminarians aspiring to become Holy Ghost Fathers. She coordinates services for adults with disabilities; he’s an engineer for the Washington Suburban Sanitary Commission. “We’re trying to build a $117 million gas generator,” Gary Grey said, contrasting that to the $8,000 St. Joseph donated to build the new well in Poteau. In addition to visits to Poteau, the partnership has included treks to Odenton by the St. Peter pastor, formerly Father Toussaint Cherry, now Father Jean Merat, timed for an annual spaghetti dinner in September that is as much celebration as it is fundraiser. The new building in Poteau includes accordion walls that convert classrooms into a large assembly space, an architectural touch borrowed from St. Joseph and its Corrigan Hall. It was designed with a second floor in mind, which would allow the school to add seventh and eighth grades. To make that happen, the parish needs to raise $14,000, to match the sum donated by the family of the late Peter Gorman, a longtime parishioner. With Church of the Holy Apostles in Gambrills merging into St. Joseph in late spring, the anticipation is that new parishioners will show the people of Poteau an equally warm embrace. Deacon Rodrigues Mortel, director of the archdiocesan Missions Office, counts St. Joseph Parish in Odenton among the many successes of the Baltimore Haiti Project. As Deacon Mortel explained, the funds that parishes in the archdiocese send to sister parishes in the Diocese of Gonaives are vital. Deacon Mortel is a native of St. Marc, Haiti, where he has directed the construction of the Good Samaritans School and the James M. Stine College, the equivalent of a K-8 and a high school, respectively. His next project there is the construction of a pre-school, which he hopes to open in fall 2015.